I hope you all read my last blog and found it useful? This is a continuation of the first blog and in this blog I am going to talk to you about core strengthening and conditioning. I am happy to answer any questions about this or any of my past and future blogs, and I know the RG Active Coaching Team are also on hand for any help you all need to improve your fitness, running, strength or any other area of your ‘Active’ life that needs work. The gluteals are made up of 3 muscles: gluteus maximus, medius & minimus and have a very important functional role in stabilising the lumbar-pelvic region. During running the gluteal muscles act as stabilisers with maximus helping to maintain upright posture. Medius & minimus work together to maintain a level pelvis when weight bearing on one leg. 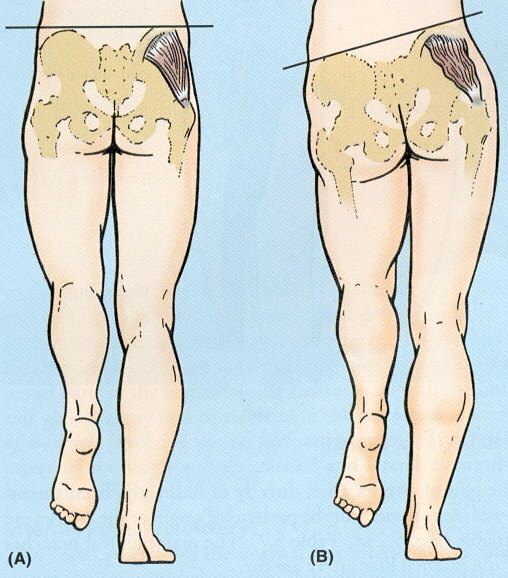 The figure below shows someone with normal & weak gluteus medius/minimus. Try this simple test in front of a mirror and look to see if your hips remain level. The big mistake that many people make is to train these muscles individually, no muscle works in isolation. Muscles must be worked functionally and mimic the movements required of them, be it running, cycling or just lifting a box. These stabilising muscles tend to become weak or ‘switch off’ and consequently do not have enough endurance for most activities, never mind running for 4+ hours. The best way to train the stabilisers is with light loads and many repetitions or long static holds, in positions that mimic your activity, in this case running. When running we tend to flex or lean forward from the waist and if maximus is not being recruited enough to keep us upright, this can lead to low back pain (LBP). Try the bridge exercise to help improve the ability of maximus to extend the spine. Lie on your back with knees bent, draw in the lower abdominals (keep breathing) and gradually curl your buttocks off the floor as below, squeezing your buttocks. Try 10 reps and hold for 10sec building to 5 x 30sec and then 3 x 60sec. One-leg squat: (picture shown using the TRX equipment). This exercise not only trains leg strength but also medius and minimus for pelvic stability. Stand upright on one leg in front of a mirror, draw in lower abdominals and squat down pushing your bottom back making sure to keep your knee pointing forward over your laces and your hips level. Squat as far down as you can without loosing balance or form. Try 3×10 on each leg. This can be performed leaning up against a swiss ball if you find it hard to balance at first.